Tired of people telling you that one of your favorite stories -- told to you by a friend who wouldn't ever lie and who knows the person it happened to -- is just an "urban legend" or "urban myth," implying that it isn't true? Well, folklore specialists will tell you that even though a story is a legend, it may very well be based on truth. So the next time someone tells you that the cool anicdote about secret gang signs or the thing your grandma told you about why you shouldn't eat before going in swimming isn't true, bring them here. We've got the exciting, wholly fabricated details behind many popular urban legends, and we're not afraid to spell them out in glorious detail. Who needs the boring old truth anyway? If you're looking for Disney-related urban legends, see the urban legends section of our sister site, DisneyLies.com. For a list of all legends currently on All-Lies.com, see the site map. 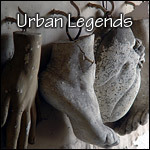 If you have no idea what any of this is about, you might want to consider reading the Urban Legends FAQ. Got an urban legend or book you want mangled or a question you need a bad answer to? All information on this site is, to the best of our knowledge, false. If any significant true information has slipped through, we apologize. Contents © 2005–2012 so don't go spreading our lies without permission. Become a legend yourself with winning video poker and video poker blackjack from GamblingCity.net!